IBPS SO (Specialist Officers) Exam 2018 Interview Call letter Download from ibps.in: The IBPS SO main examination was held on January 28. The Institute of Banking Personnel Selection (IBPS) has released interview call letters for Specialist Officers Exam (CRP SPL-VII) 2018 on the official website, the link for which is ibps.in. Further, the interview call letters will be available to download till March 2. Institute of Banking Personnel Selection has released IBPS SO Interview Call Letter 2019. 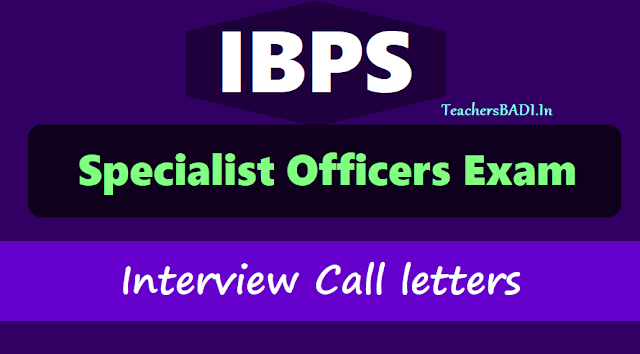 Candidates who want to appear for interview for Specialist Officer post can download the call letter through the official site of IBPS at ibps.in. Candidates will be able to download the call letter from February 14 till March 2, 2019. IBPS SO Interview Call Letter 2019: Steps to download: Candidates will have to check these simple steps to download the admit card. Visit the official site of IBPS at ibps.in. Click on Download Interview Call Letter for IBPS SO. A new page will open where candidates will have to enter the login credentials- registration number and password. Enter the captcha code. Your result will be displayed on the screen. Download and keep a hard copy of the same for further need. IBPS will conduct the interview in the month of February 2019. The Main examination result was out a few days back. The official notification was released on November 6, 2018. This recruitment drive will fill 1599 Specialist Officer posts in the banks. For more information, candidates can visit the official site of IBPS. Step 6: Download and take a printout for further reference. IBPS: IBPS is an autonomous body which is created to render assistance to organisations in areas such as personnel like recruitment, selection, placement, designing, and developing suitable measurement tools/tests. IBPS provides its services to all Public Sector banks, SBI, Associate Banks of SBI, RBI, NABARD, SIDBI, few Co.op. Banks, LIC and Insurance companies which are regular members of the IBPS society.